A VIP assassin dressed in red spandex with white armor. He fancies himself as one of the best, but has ideals on morality very different from Top Gunder's, who he succeeded in the army. A master marksman who wields twin pistols, he worked with American terrorist organizations, killing government officials and receiving a promotion from Explosive Fighter to Violent Spirit before coming to Japan to kill Metalder and deal with Top Gunder. 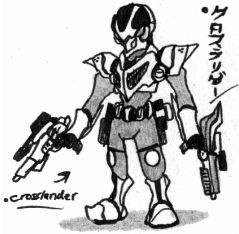 He also obtains a handgun custom-made for battling Metalder. Crosslander loses his first encounter with Top Gunder, but in their second encounter, he defeats and damages the traitor. He originally wore a winged snake ornament on his forehead, but Metalder damaged it during their first encounter. His second, upgraded head is also damaged, this time by Top Gunder, even though it was equipped with a secret blaster that Top Gunder also damages. In Episode 23, he hides in the tall grass near the finish line of the Four Army relay race and shoots Strobe down each time he tries to become airborne. He fights Top Gunder and Metalder again and is destroyed by Metalder's Laser Arm attack in Episode 33. Goblit and Dedemos are Crosslander's assistants. Both are Light Fighters. Goblit is black and silver and armed with a bayonet while Dedemos was blue with horns and uses a handgun and a drill. Goblit and Dedemos are seen in Episode 19, when they battle Metalder in the Ghost Bank. They appear again, alongside Jars and Gebaros in Episode 22. In Episode 23, these two both appeared in the Four Army relay race and in Episode 30, to help Galdos. In Episode 35, they appear one last time in battle with Geldring, assisting him, only to be destroyed together by Top Gunder.